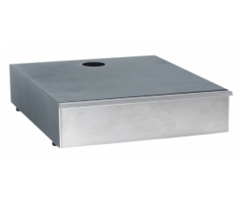 Under grinder knock out drawer manufactured from steel and black powder coated construction. Fitted with a nylon coated knock out bar to provide quieter operation. The drawer sits on 4 rubber feet to prevent it slipping on a counter top. 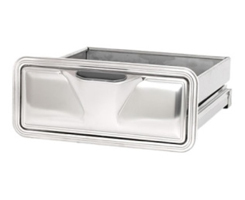 Chrome under grinder knock out drawer manufactured from stainless steel polished construction to provide years of service. Fitted with a nylon coated knock out bar to provide quieter operation and also incorporates a vented top to stop mould build-up in the waste coffee. The drawer sits on 4 rubber feet to prevent slipping on the counter top. 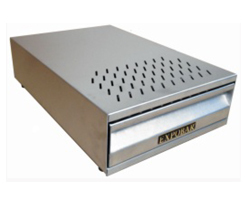 Heavy duty under grinder knock out drawer manufactured from stainless steel and finished with a brush effect to provide years of service and with 50% greater capacity than the standard drawers. Fitted with a nylon coated knock out bar to provide quieter operation and it also incorporates a vented top to prevent mould build-up in the waste coffee. The drawer sits on 4 rubber feet to prevent slipping. Polished stainless steel under counter built-in knock out drawer. A very high quality product ideal for fitting below the espresso machine where space at the side is not available. 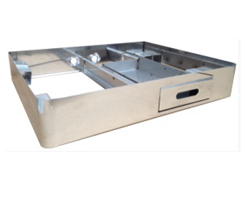 Compact under machine knock out drawer suitable for Expobar 1 & 2 group compact machines where space is limited. 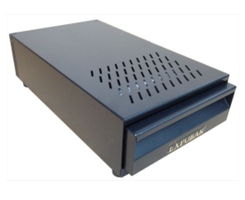 Manufactured from stainless steel and steel to provide years of service. Fitted with a solid knock out bar and removable inner drawer. The drawer has 4 rubber feet to prevent slipping and the machine sits on top adding an extra 113mm to the overall height. 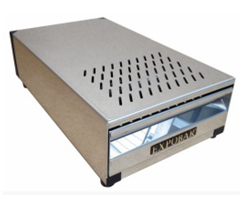 Polished stainless steel under machine knock out drawer for Expobar 2 group standard range of machines where space is vital. Manufactured from stainless steel to provide years of service and fitted with a solid nylon knock out bar. The drawer sits on 4 rubber feet to prevent slipping on the counter top with the machine sitting inside the drawer adding only 70mm to the overall height of the machine.